We’re back. Me and the girls. Sucking in that endless sky and the sea-brazen air that blows around our heads, rustling our hair and filtering through our brains so that only the moment remains. It blows away all the fog and fug until our skin tingles with newness and weather. Donegal. No need for Spa treatments here – the wind and sand and sea strip away all the dead skin and the dead thoughts, like a facial for the soul. Long lovely moments of nothing. Long lovely moments of everything. 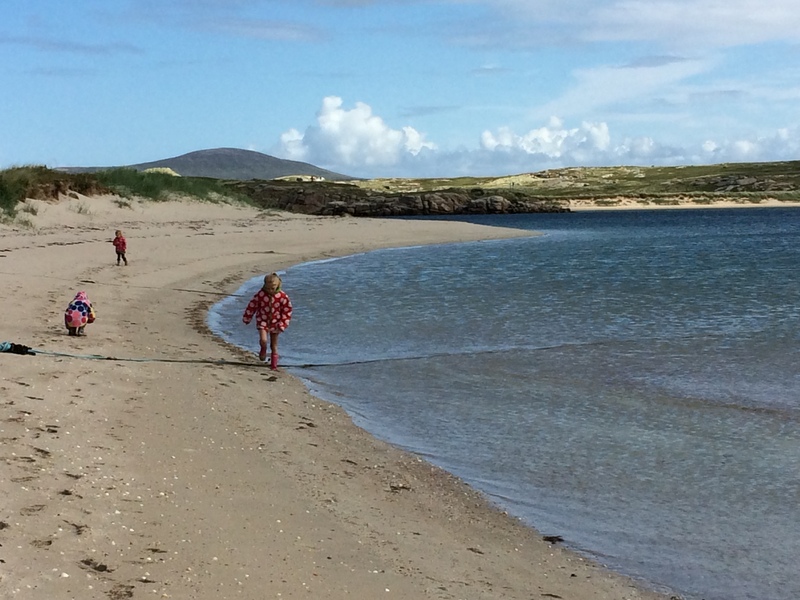 Donegal. It always feels like coming home. The forecast was for rain every day, but the sun has defiantly burst through, sticking out it’s tongue saying “Na na na na na” and giving us time to run on empty glorious beaches where the horizon is so far away it feels otherworldly. It shines down a brightness that lights the water in the sea, in the estuary, in the puddles everywhere so it feels we are dancing under spotlights. Welly boots are de rigour. Washing is optional. Eating is spontaneous. 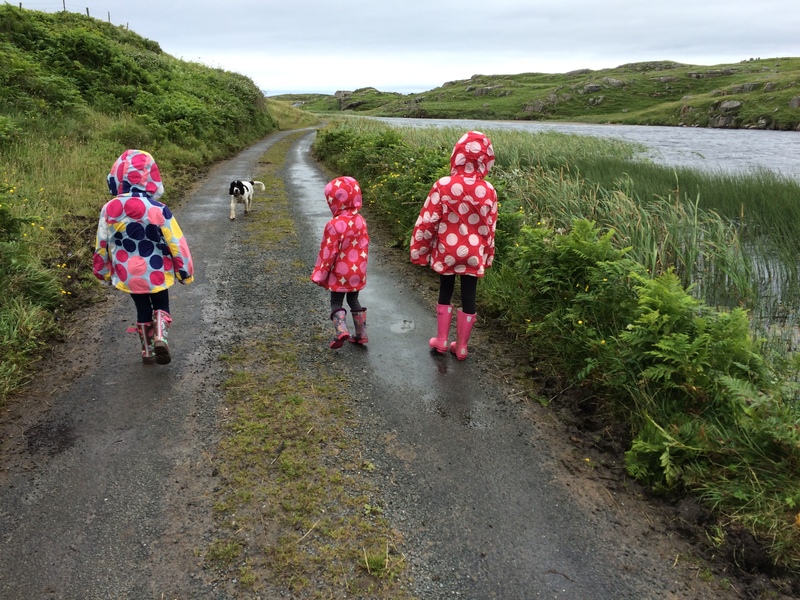 Summer days in Donegal…. my childhood memories and their childhood moments merging into one long Welly Walk through my life… collecting shells and crabs, picking flowers, poking jellyfish and seaweed, catching worms, chasing butterflies, running into the waves, running away from the waves, checking out rock pools, stomping, splashing, clambering, climbing, exploring, hunting, finding, discovering, eating, talking, fighting, laughing. Staying up late, sleeping later, snuggles in between. Hot chocolate on tap, melting marshmallows scooped out with a teaspoon. Sun hot sand lashing our legs jumping in the sea. Horizontal rain lashing the windows, board games by raging fire while the wind howls sadly outside because it can’t come in and join us. Yesterday we went for a three hour hike over beach and rocks and pot-holed roads and harbour and dunes. We collected shells and poked dead jellyfish. The wind pushed us along and then we had a sun-blazed rest for chocolate biscuits and gingersnaps and tea from a flask, and as we reached the little harbour the rain drenched us in buckets but we laughed and ate M&M’s and the sun came out again and we took all our coats off. Donegal. Where the sun and rain and wind are like inseparable triplets. A welly walk in our T-shirts, or a welly walk in our coats. 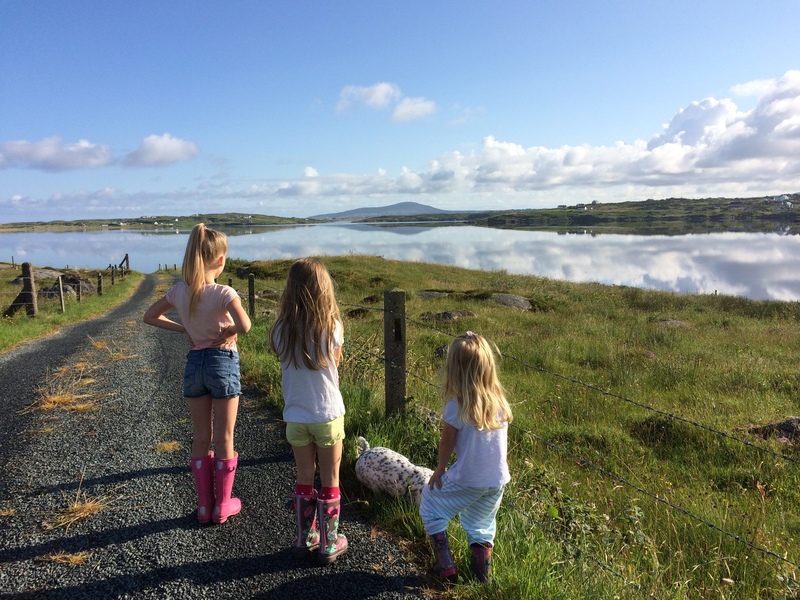 Donegal daydreams. We’re back. I would love to go there sometime. Sounds so tranquil!